Global economic growth should increase over the next two years with continuing signs of improvement, according to the United Nations World Economic Situation and Prospects 2014 (WESP) report, launched today. The global economy is expected to grow at a pace of 3.0 per cent in 2014 and 3.3 per cent in 2015, compared with an estimated growth of 2.1 per cent for 2013. The world economy experienced subdued growth for a second year in 2013, but some improvements in the last quarter have led to the UN’s more positive forecast. The euro area has finally ended a protracted recession. Growth in the United States strengthened somewhat. A few large emerging economies, including China and India, managed to backstop the deceleration they experienced in the past two years and veered upwards moderately. These factors point to increasing global growth. According to WESP, inflation will remain tame worldwide, but the employment situation will continue to be challenging. While growth in international trade flows is expected to pick up moderately to 4.7 per cent in 2014, the prices of most primary commodities are projected to be flat, although any unexpected supply-side shocks, including geo-political tensions, could push some of these prices higher. The report warns that international capital flows to emerging economies are expected to become more volatile. “Our forecast is made in the context of many uncertainties and risks coming from possible policy missteps as well as non-economic factors that could stymie growth,” said Shamshad Akhtar, UN Assistant Secretary-General for Economic Development. In the United States, fiscal tightening and a series of political gridlocks over budgetary issues weighed heavily on growth; however, quantitative monetary easing boosted equity prices.The U.S. labour market and housing sector continued to recover. Gross Domestic Product (GDP) in the U.S. is expected to increase 2.5 per cent in 2014. Western Europe emerged from recession in 2013, but growth prospects remain weak, as fiscal austerity will continue and the unemployment rates remain elevated. GDP in Western Europe is expected to grow by 1.5 per cent in 2014. Growth in Japan has been boosted by a set of expansionary policy packages, but the effects of forthcoming structural reforms remain uncertain and an anticipated increase in Japan’s consumption tax rate is expected to curb growth. GDP is forecast to grow by 1.5 per cent in 2014. Growth prospects among large developing countries and economies in transition are mixed. Growth in Brazil has been hampered by weak external demand, volatility in international capital flows and tightening monetary policy, but growth is expected to rebound to 3 per cent in 2014. A slowdown in China has been stabilized and growth is expected to maintain at a pace of about 7.5 per cent in the next few years. India experienced its lowest growth in two decades, along with large current account and government budget deficits plus high inflation, but growth is forecast to improve to above 5 per cent in 2014. In the Russian Federation growth weakened further in 2013, as industrial output and investment faltered, and is expected to recover modestly to 2.9 per cent in 2014. Among developing regions, growth prospects in Africa remain relatively robust. After an estimated growth of 4.0 per cent in 2013, GDP is projected to expand by 4.7 per cent in 2014. The report emphasized the dependence of Africa’s growth on investment in infrastructure, trade and investment ties with emerging economies, and improvements in economic governance and management. 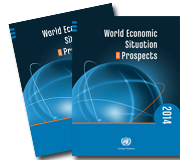 More detailed regional forecasts from WESP will be released in January 2014. The report stressed that the risks associated with a possible bumpy exit from the quantitative easing programmes by the U.S Federal Reserve (Fed) threaten the global economy. As already seen somewhat during the summer of 2013, efforts by the Fed to pull out of quantitative easing programmes could lead to a surge in longterm interest rates in developed and developing countries. Tapering could also lead to a sell-off in global equity markets, a sharp decline of capital inflows to emerging economies and a spike in the risk premium for external financing in emerging economies. These first-round shocks in international financial markets could transmit quickly to developed and developing economies. The report warns that as the Fed is expected to taper and eventually unwind its quantitative easing programmes, emerging economies will face more external shocks. While economic fundamentals and the policy space in many emerging economies are better than when the Asian financial crisis erupted in 1997, emerging economies with large external imbalances remain particularly vulnerable. Other uncertainties and risks include the remaining fragility in the banking system and the real economy in the euro area and the continued political wrangling in the U.S. on the debt ceiling and the budget. Beyond the economic domain, geopolitical tensions in Western Asia and elsewhere remain serious risks. These and other risk factors, unfolding unexpectedly, could derail the world economy far beyond the report’s projections. ensure sufficient resources to the least developed countries. WESP is produced at the beginning of each year by the UN Department of Economic and Social Affairs (UN/DESA), the United Nations Conference on Trade and Development (UNCTAD) and the five United Nations regional commissions. The full version of the report will be available 20 January 2014.